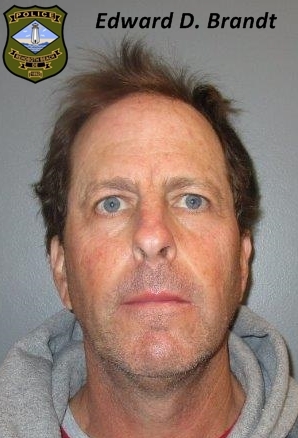 Edward D. Brandt, 58, of Newtown, Pa. was arrested Sunday (02/03/19) afternoon during the Special Olympics Polar Bear Plunge event when he was observed by uniformed officers attempting to sell counterfeit event merchandise. Just after noon, while working event security for the Polar Bear Plunge, a uniformed Delaware State Trooper and a DNREC Park Ranger were alerted to Brandt by an event participant. The officers located Brandt on the beach in the area of Rehoboth Avenue holding up a counterfeit event t-shirt attempting to sell it. Upon seeing the officers, Brandt attempted to conceal the t-shirt he was holding up for sale. Upon contacting Brandt, officers recognized him from a photo circulated via media outlets in 2016 attempting to identify him for conducting similar counterfeit sales at the plunge event that year. Brandt was attempting to sell t-shirts similar to the one pictured in the 2016 photo, excepted the date was changed to February 3rd, 2019. The investigation was turned over to the Rehoboth Beach Police Department. Through their investigative efforts, officers were able to recovered approximately 145 counterfeit Lewes Polar Bear Plunge t-shirts and several hundred dollars in United States currency from Brandt. Brandt was arrested and charged with displaying and attempting to sell trademark counterfeit merchandise, a felony offense due to a prior conviction in 2005 in Kent County, Delaware. Brandt was also charged with theft by false promise under $1500, a misdemeanor. Brandt was arraigned by the Justice of the Peace Court and released on his own recognizance. Release by PIO Lt. Jaime Riddle.